Hipstamatic, the popular retro camera app for the iPhone, will soon get an update that will include the launch of a new photo printing service. Slated for release on Friday, the update will integrate the HipstaMart.com retail Website within the mobile app. Hipstamatic is adding a feature that will let users of the retro camera app order prints from within the app. Hipstamatic is a camera app that transforms the iPhone into a toy camera, right down to the viewfinder window and shutter release button. By combining the different virtual film, lenses, and flashes available through Hipstamatic, you can give the images you capture with the app their own unique look. With the launch of HipstaMart.com, you’ll be able to order prints from within Hipstamatic. Prints come in two sizes—4-inch and 7-inch. 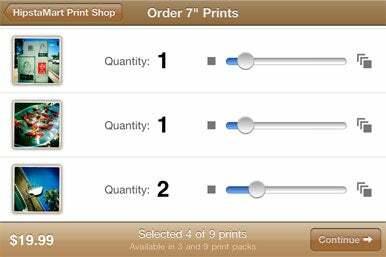 The 4-inch prints come in packs of nine ($4.99) and 24 ($9.99), while 7-inch prints sell in packs of three ($7.99) or nine ($19.99). HipstaMart.com site will let you track your order. Technically, all photos are printed with a silver-halide process, and printed on archival quality Fuji Crystal photo paper. For an extra bit of eco-friendly fun, prints arrive in a recycled cardboard package that you can fold into a free-standing frame. HipstaMart printing isn’t the only new feature arriving with Friday’s update. The Hipstamatic 170 update also brings a new HipstaPak—The Mission—which is available via in-app purchase for $1. Hipstamatic’s HipstaPaks are bundles of add-on film, lenses, and flashes that add additional looks to photos taken with the app. The Mission—inspired by Hipstamatic developer Synthetic’s recent move to San Francisco—contains a new lens and film, both of which add a washed-out, ethereal quality to the photos. The Hipstamatic 170 update also includes a number of bug fixes, and minor new features such as Tumblr sharing and the ability to completely disable the flash built into Apple’s iPhone 4. The free update to the $2 Hipstamatic hits the App Store Friday, and runs on any iPhone or iPod touch running iOS 3.1 or higher.